Has expressed an interest in becoming Catholic, but was baptized in another faith? Has never been baptized in any faith? Was baptized Catholic, but has not celebrated the Sacraments of Eucharist and Confirmation? 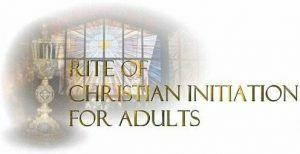 RCIA, The Rite of Christian Initiation for Adults (and Adapted for Children), offers the opportunity to come together as a faith community to learn more about the Catholic faith. Sessions focus on the teachings and experience of the Church and prepare individuals to celebrate the Sacraments of Baptism, Confirmation, and Eucharist. You are invited to begin or continue your faith journey with us at St. Paul’s by participating in the RCIA process with your questions, your insights and your faith story. Meetings are held every Wednesday evening from 6:30-8:00 in the Family Life Center. (Children meet in the school). For more information or to schedule an interview and complete the required paperwork, please contact MJ Antone at 222-0608 or by email at mjstpaulre@gmail.com.